Sign up to Dry July Australia 2018 and raise funds for Look Good Feel Better. Look Good Feel Better is a free national community service program run by the Cancer Patients Foundation, dedicated to teaching cancer patients how to manage the appearance-related side-effects caused by treatment for any type of cancer. Women, men and teens participate in practical workshop demonstrations covering skincare techniques to address common side-effects like dryness and sun sensitivity; makeup tips to help correct and conceal redness, sallowness, pigmentation and dark circles as well as techniques for drawing on eyebrows; and advice on headwear including scarf styling and wig selection. Each participant receives a complimentary Confidence Kit full of skincare and make-up products donated by the cosmetic industry, and an instruction booklet to use as tools for application throughout the workshop and for continued use in their own homes. Participants also benefit from the opportunity to meet others in a similar situation. During the workshops, friendships and additional support networks are formed that can be invaluable during diagnosis and treatment. Over the next twelve months close to 900 workshops will be held in 180 venues across Australia, with the ability to support over 11,000 people undergoing cancer treatment. The program is managed by a small team of team of staff and relies on the support of 1,300 trained cosmetic, beauty and hairdressing professionals who volunteer their time and expertise to help deliver the workshops across the country. With no government funding, the Cancer Patients Foundation relies heavily on the generosity of corporate and community supporters to allow for the Look Good Feel Better program to be provided to cancer patients free-of-charge. My partner and I met in Australia and moved to London together four years ago when I was 23 years old. I am self-employed, providing consulting and training services in the data protection and IT governance environment for businesses. I set-up the business when I was living in the UK alongside co-founding a cybersecurity startup with exciting new opportunities. Whilst living in the UK, I noticed a pea-sized lump in my neck. It was around for a few weeks and I didn’t think much of it. Then over two days, the lump grew from the size of a pea to the size of a golf ball and I knew I had to immediately get it checked. I wasn’t actually worried about it at all at first; the three week process was that it was just a cist and we were testing to be sure, so I went to my hospital appointment for the results by myself. But the ultrasound and biopsy confirmed a cancer diagnosis – Hodgkins Lymphoma. When I was first told, I didn’t really comprehend what it was. I immediately started asking questions about a solution. When the doctor mentioned that a few months of chemotherapy would be required, everything sank in and I was an emotional mess. I spent the next 48 hours telling my family, calling all my clients and dropping out of work, and packing up our apartment to fly home to Australia immediately for treatment. The decision was made instantly as there wasn’t any way I’d be tackling this alone in the UK. After receiving my diagnosis, everything stopped. The financial position my partner and I had forecasted we would be in by this time so we could start achieving our future plans was disrupted, and emotionally I felt like my life was ‘taken’ from me. However, you do gain a new appreciation for everything you ever had, realise you can earn it all back, and you start to move forward. When I was offered the chance to attend a Look Good Feel Better workshop, I wasn’t reluctant to attend. 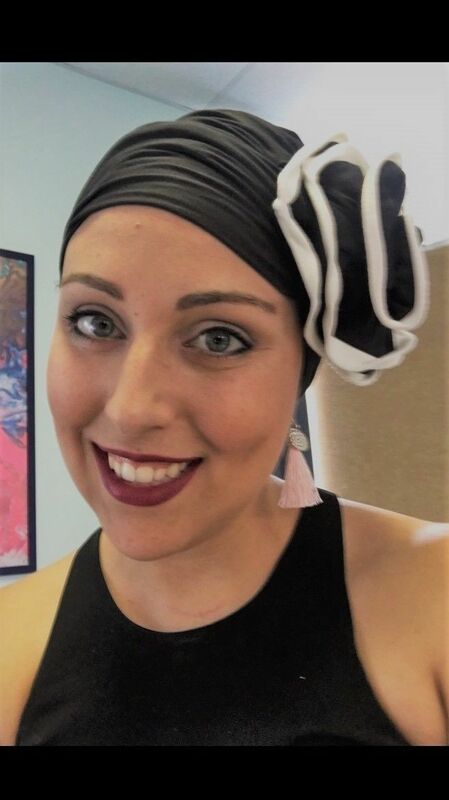 I know someone who was reluctant because she didn’t want to feel like she had cancer, and such a workshop would confront that, but we actually ended up attending together and it felt like a great opportunity for friends to just hang out and get some make-up tips. The workshop delivers exactly what it offers – it makes you look good and feel better. 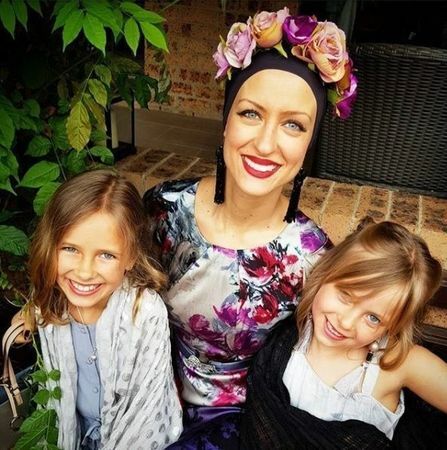 Not just because of the make-up or headwear, but also because you have a chance to spend time with other women who are dealing with the impact of their condition. The challenge of managing the physical side effects is one hundred times better when you’re not trying to figure it out on your own. How to properly draw on eyebrows and put colour back in my cheeks was key for me, but being able to just let go of all the stresses that cancer causes due to physical changes and to be looked after for those two and a half hours is incredible. The whole workshop was stress-free and fun. Funding approved for another 150 workshops! A further 150 workshops have received funding thanks to a second grant from the Dry July Foundation. 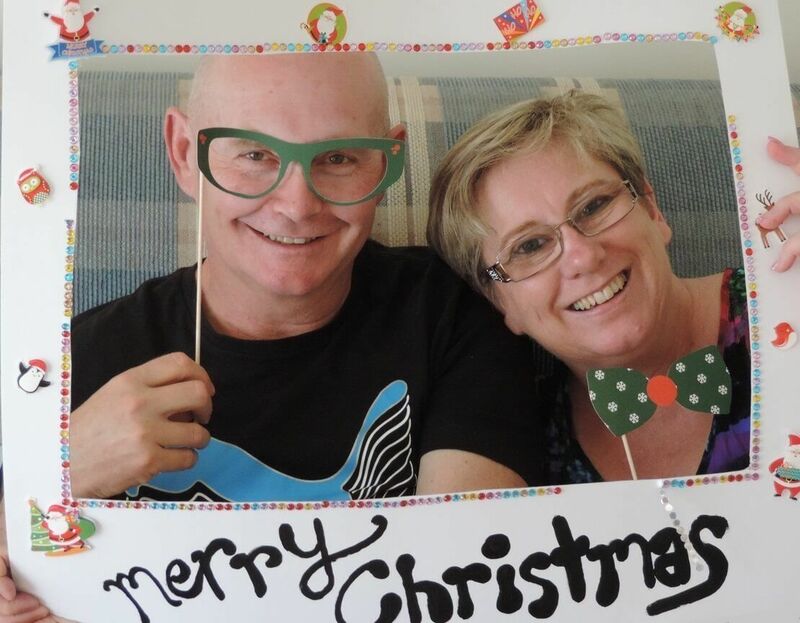 In 2019, almost half of the workshops that Look Good Feel Better will now have been funded by thanks to the fundraising efforts of Dry July participants; a magnificent outcome. Look Good Feel Better workshops are complete free for cancer patients to attend no matter what stage of their diagnosis. You can read more about the workshops and check for availability by clicking HERE. A total $300,000 has been awarded to Look Good Feel Better Australia in the 2018 Dry July Foundation early grants round. This will fund 300 of the 1000 workshops that will run in Australia during the next twelve months. Look Good Feel Better is a free national community service program run by the Cancer Patients Foundation, dedicated to teaching cancer patients how to manage the appearance-related side-effects caused by cancer treatment. Women, men and teens participate in practical workshop demonstrations covering skin care, make-up and head wear, leaving them empowered and ready to face their cancer diagnosis with confidence. Workshops cover skincare techniques to address common side-effects like dryness and sun sensitivity; makeup tips to help correct and conceal redness, sallowness, pigmentation and dark circles as well as techniques for drawing on eyebrows; and advice on headwear including scarf styling and wig selection. Each participant receives a complimentary Confidence Kit full of skincare and make-up products donated by the cosmetic industry, and an instruction booklet to use as tools for application throughout the workshop and for continued use in their own homes. Participants also benefit from the opportunity to meet others in a similar situation. During the workshops, friendships and additional support networks are formed that can be invaluable during diagnosis and treatment. Look Good Feel Better workshops are open anyone undergoing treatment for any sort of cancer. I had surgery and it was considered a success, but as my cancer had spread to my lymph nodes, I needed to undergo a course of chemotherapy. This of course meant losing my hair. My nurse suggested I attend a Look Good Feel Better workshop to help me learn some useful ways to manage the changes I was experiencing to my appearance. 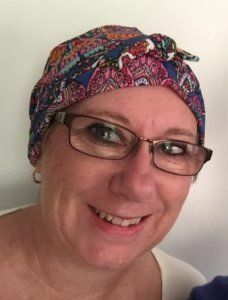 While I was offered practical guidance about make-up and skin care, I was really interested in mastering head coverings and found the advice on scarves and scarf styling invaluable. Mostly though, it was really beautiful to connect with other women in a similar position and I felt so encouraged by the lovely volunteers. I am very much a changed person. I went from being an extremely energised, fit and strong independent woman to a frail, sickly, fatigued person who needed help all the time. But I try to stay positive because life happens and you’ve got to adjust and work with the direction it’s sending you in. We all chant these mantras, that whatever life throws at you, you’ve got to make the most of it. And my experience has taught me that you have to still live. You have to still find the joy in every day. "Earlier this year, life as I knew it changed completely. I was diagnosed with cancer. I am a 54-year-old mother of three adult children and grandmother to three grandchildren. Before my diagnosis, my life revolved around family but I also worked as a full-time Human Resources Manager which kept me very busy. We live on a five-acre block in Dubbo with a beautiful garden which takes up many pleasurable hours of work. My initial reaction worried my doctor because I really just sat there silently trying to absorb my new reality, while my head was racing in turmoil. He kept asking if I had any questions, but I didn’t know what I wanted or needed to know. I really just wanted the time to take it in and think on my own. Before long I came out of my fog enough and organised to see a specialist surgeon and my breast care nurse mentioned the Look Good Feel Better workshop to me. I had also heard about it through friends in the community. My sister encouraged me to go along and have some fun with it. Prior to being ill I used to do a full hair and make-up routine daily, even on weekends! My appearance had changed so much, I felt that attending the workshop might give me some tips to cope with this. I also thought it might be good to have some fun with other ladies who would be feeling the same way. Sure enough I went along and there were a lot of positives about the workshop, the amount of information covered, the quality of products we used – and the fact we could take them home! But mostly, I appreciated the caring nature of the volunteers who ran the workshop – they were all very naturally gentle and kind people who made me feel very welcome and comfortable. They were honest and funny, relaxed and helpful. The workshop renewed my interest in putting on make-up and that made me feel better and more confident when I went out in public. I became less worried about my bald head and have become more accepting of my appearance through seeing so many other ladies going through what I was on the day. It was actually the very first time I had allowed anyone else to see me in my bald state. I was surprised to find out that Look Good Feel Better provides this service for free and can only do this because of people like you who donate and support the program. I would recommend Look Good Feel Better to others going through treatment for cancer. It’s an opportunity to have fun, but it also reminds you that you are not alone and gave me something besides the words “cancer” to focus on. I would encourage you to please make a donation today and ensure Look Good Feel Better can continue its work right around Australia. Since my diagnosis, I really can’t believe how much time and effort goes into just handling things each day. Right from dealing with surgery, waiting on test results, trying to remain positive and healthy, to starting chemotherapy and dealing with so many side-effects and challenges that this treatment has hit me with.